Pancake Day (otherwise known as Shrove Tuesday) is the day before Lent. Lent is the 40-day-long period running up to Easter during which Christians traditionally fasted. During Lent it used to be forbidden to eat any dairy products, so Pancake Day therefore evolved from the need to eat up any rich ingredients before the abstinence of Lent. The word "Shrove" comes from the tradition of Christians confessing (or shriving) of their sins. The first day of Lent is called Ash Wednesday. Shrovetide is a three-day festival beginning on Shrove Sunday (otherwise known as Quinquagesima Sunday), running through to Shrove Tuesday. The Monday is known as Shrove Monday or Collop Monday. A collop is an egg fried with bacon and was the traditional dish to be eaten on Shrove Monday. The fat from the bacon would then be used in making the pancakes on the following day. The day is still a day of merrymaking and has a large number of local traditions associated with it. 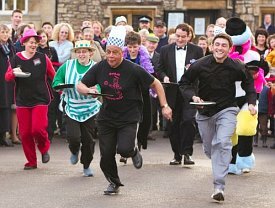 The pancake race is a tradition started in Olney in Buckinghamshire way back in 1445. The aim of the race is simple - run as fast as you can while tossing a pancake with a frying pan. This requires a certain amount of skill to avoid breaking the pancake! The course in Olney is 415 yards long, starting at the Bull Hotel and finishing at the Parish Church. A few places celebrate pancake day with a riotous game of football. One such place is Atherstone in Warwickshire where a football game (called the Atherstone Ball Game) has been held on the streets of the town every year since 1198 (over 800 years ago). The ball used is a large leather ball made by the rugby-ball manufacturers Gilbert. The aim of the game is to be the last person holding the ball at the end of the game - as such there can be quite a scrummage to get hold of the ball! See photographs and videos from the 2006 Atherstone Ball Game. Other places that stage Pancake Day football games are Ashbourne in Derbyshire (the Royal Shrovetide Football game), Alnwick in Northumberland, St. Columb Major in Cornwall (called Hurling the Silver Ball), and Sedgefield in County Durham (the Sedgefield Ball Game). For the last 200 years or so, the tradition in Scarborough in England has been for everyone to congregate on the seafront and skip. A dozen or more people may be skipping on a single rope! Makes around 8 pancakes (or more if you make them thinner). Mix everything together - it really doesn't matter what order you add stuff, but adding a bit of the milk before the eggs and then adding the rest of the milk seems to be best. Make sure you whisk it well otherwise it goes all lumpy and that makes bad pancakes. I like to let the batter rest for about 30 minutes in the fridge. However, when I'm making bulk quantities for the party, I often don't get the chance to do that! It doesn't make too much difference. To cook, heat a frying pan over a moderate heat with a small bit of oil (olive oil is best!). Add enough batter to cover the base of the frying pan. When the batter has dried and started to brown on the bottom you can flip the pancake to cook the other side - this is normally the time when a large amount of mess is made by people failing to toss the pancake in the correct manner! The pancake is ready when both sides have browned slightly. The best part of pancakes is experimenting with different fillings. The traditional filling is sugar and lemon juice, but you can use things like honey, fruit and berries, maple syrup, chocolate sauce, honey, marmalade, cream, ice cream, and so on. The filling would normally be placed on the pancake and then served with the pancake rolled up.